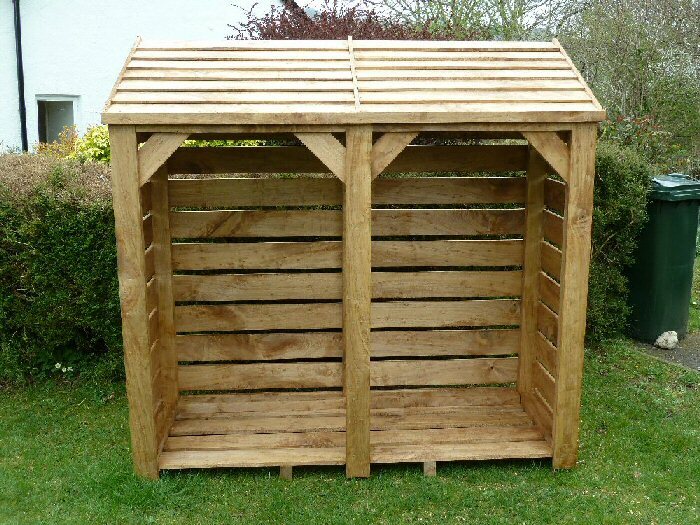 This log store is approx 6' Long and 6' High (186cm x 186cm) and 3ft deep (90cm base plus overhang approx 8cm). Delivered fully constructed and treated, with and a choice of straight or curved side bars. Standard delivery is free with this log store. Please do check that this depth will get through any gates/doors/passages etc on the way to where it will be sited. This log store will take up to 36" depth of logs and kindle and stores around 2.75 cubic mtrs of logs. Depth approx 36" (90cm) internal, external aprox 38" (96cm) including roof overhang. Add a kindling shelf for £50 While we treat with an oil based preservative as standard, it can be left untreated if you prefer, for example if you intend to paint it (images shows untreated). It can be treated either Light brown, dark brown or cedar (a red brown). Delivery This size is best not to be sent by Pallet delivery, we prefer to deliver it ourselves and delivery cost is free to anywhere less than 3 hours drive from DY11. Andrew can help you to site it if there is someone physically able to lift and carry it at your end. If no-one can lift and carry it may be possible to send two people, give Sadie a call to check. Please check it will fit through anything it needs to go through such as gates etc, and that there is turning room if needed. For anything more than 3 hours away it will need to be sent by pallet and there is a delivery charge, at actual cost for a double pallet. Please send me your postcode so I can get you a quote from the delivery company. Most postcodes for a double pallet will be over £150.